Wild cherry is one of our earliest fruits to ripen. The cherries turn from green to red to almost black around the middle or end of July. You should check their progress regularly to ensure you manage to collect a few of them before the hungry thrushes get them all! The fruits can be pulled from the tree individually. 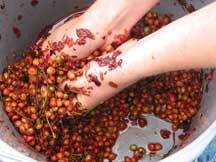 It is also possible to pick cherries or the stones (cherry seeds) from off the ground. 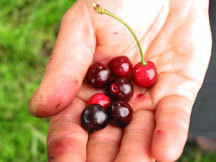 When ripe, cherries are very soft (and often sweet and delicious! ), so extracting them tends to be quite straightforward. Follow the mashing technique to remove the flesh or eat the cherry and spit out the stone into a waiting bucket! If you choose not to eat the cherries, you will need a couple of buckets, a sieve, a flat-bottomed stick and a water supply. The extracted seed should be mixed with equal parts horticultural sand or a sand/compost mixture. If using compost, use 50% leafmould or peat-free compost and 50% horticultural sand. 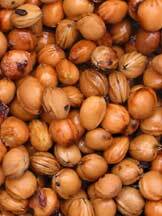 For each handful of seeds add two or three handfuls of mixture. Select a pot that has enough room for this seed/sand mixture (and a bit more) and put a layer of small stones in the bottom for drainage. Cover these stones with sand. Place the seed/sand mixture on top of this and cover this with 2-3cm sand. Label the pot and stand in a shady spot outdoors. This should be done fairly soon after collection. Wild cherry stones benefit from being exposed to the warmth of late summer before the onset of colder temperatures in winter – this can actually help more of them to germinate in the following spring. Whilst wild cherry provides us with one of the earliest fruits in the year, it also is one of the first of our trees to germinate in the spring – generally at the end of February. Check to see how they are doing in mid-February. As soon as you see about 5 or 10% with roots emerging it is time to sow – the roots shouldn’t be allowed to get too long or our trees will be weaker and oddly shaped. Sow 2 or 3 in a pot or broadcast them so that they are about 2cm apart. Firm the soil by pressing or rolling and cover with horticultural grit. Watch out for mice! Cover your beds with netting and your pots with wire mesh. When the plants are about 10cm tall you can remove the protection. Maintain protection from mice and watch out for blackfly. This is the only real problem wild cherry will suffer from, but growth can be severely checked if there is a bad infestation. Be warned though! 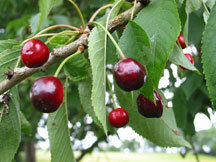 Don’t be tempted to use a systemic insecticide – wild cherry does not tolerate this kind of pesticide. Try organic solutions where possible. Keep your pots or beds weed-free. Feed regularly and water during dry spells. A light top-dressing of lime will help them along too. Plant your new cherry tree into its new home when it is 40cm tall. Prepare the site well by clearing away any weeds or grass and make a hole big enough to accommodate the root ball. Plant carefully in the hole, to the same depth as it was in the pot or seedbed, and firm back the soil.